The Kotaku Talk Radio E3 podcast spectacular was recorded earlier this week and now you can download it to hear six members of Kotaku debate the big news of the show and name some of our favorite E3 games. Host: Brian Crecente, with Brian Ashcraft, Mike Fahey, Owen Good, Michael McWhertor and Stephen Totilo (none of us are pictured in this post, in case you were wondering. 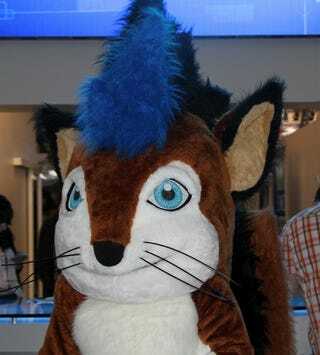 That's just a person in a mascot suit at E3). We will be back to our regular Kotaku Talk Radio format next week... if I've caught up with my sleep by then. Enjoy the show!